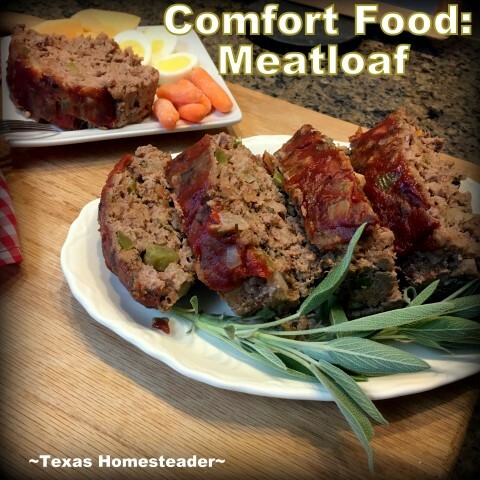 Summer Cooking: Meatloaf Is Comfort Food So Cook Lots At One Time! Today I’m sharing how I used my Cook-Once, Eat-Twice method of cooking to whip up two large loaves of meatloaf. Sure, I used my solar oven to do the cooking. But my recipe below uses a conventional oven. So whichever method you choose, you’re guaranteed to get a delicious meaty comfort-food entree with plenty leftover for the freezer too for quick heat-n-eat suppers another night. I make meatloaf often. Since I’m making two meatloaves at one time I’m utilizing planned leftovers. That’s where I intentionally cook up more of a main dish than we’ll eat with plans of remaking it into different dishes later. We’ll enjoy hearty slabs of meatloaf for supper, supplemented with a few sides. Then I’ll slice up the remaining meatloaf and freeze it into meal-sized servings. Sometimes I’ll pull a serving of meatloaf from the freezer to enjoy as meatloaf. But other times I’ll bring it out and chunk it up for spaghetti, quesadillas or other things. Meatloaf is a great prepared entree to have ready & waiting in the freezer! To make my meatloaf I pull out my ground meat from the freezer. I’m using ground wild pork today because we always have that in our freezer. Feel free to use whatever ground meat you have. I add this meat into a large bowl with the other ingredients except the ketchup. Now using clean hands I mix it all together thoroughly. Then I divide the meat mixture into two glass pans and I’m ready to cook ’em up! If you’re using a conventional oven, just bake your meatloaves at 350 degrees for about an hour. You’re looking to get the meat to 160 degrees to make sure it’s cooked through. For me, I’ll be loading these loaf pans into my *Solar Oven. Because of the moist heat and the power of the sun, it’s nigh impossible to actually burn the meatloaves in the solar oven. So the time spent inside the solar oven isn’t as important as the temperature attained at the meat in the center of the loaf pans. I’m able to do this easily with a *meat temperature probe. Heck there are even blue-tooth versions these days, which is nice for outside cooking whether grill or solar oven. I check my temps occasionally and take an opportunity to re-adjust my oven as the sun moves across the sky. About 1.5 hours later, my meat thermometer reads 170 degrees. This solar cooking time can vary based on how strong your sunshine is, how much cloud cover is present and how often you adjust your oven to follow the track of the sun. I bring in my meatloaves and spread a little ketchup on top of the loaves. Sometimes I’ll sprinkle dried herbs or a drizzle of honey into my ketchup before spreading it across the loaves, but all of this is optional anyway. Then I pop them back into the solar oven for about 10 minutes. Now I bring my meatloaves into the kitchen and allow them to rest while I put together my sides. When it’s so hot outside I often pair it with a cool dishes. Such things as pasta salad seasoned with herb bombs, raw carrots, sliced cantaloupe, sliced boiled eggs and a few homemade refrigerator pickles. Delicious!! Plus I’ll have many more servings in my freezer after tonight’s meal. So when RancherMan & I drag our tired bodies into the house after a long, hot, grimy day in the pasture, I’ll have plenty of heat-n-eat options as close as my freezer. No need to start from scratch every time you enjoy a home-cooked meal… Aaaah the joys of having prepared meals in your freezer! 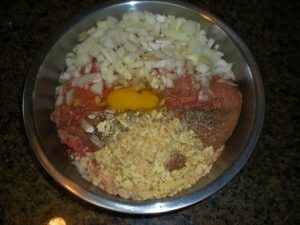 Into ground meat add all other ingredients except ketchup and mix with hands until all ingredients are thoroughly combined. Separate meat mixture into 2 glass loaf pans and pat into a firm loaf, gently sloping to the sides. This helps drain off the fat. Remove meatloaves from oven & spread ketchup on top of the cooked loaves and return to the oven for 10 minutes. Looking For Other Solar-Cooking Recipes? 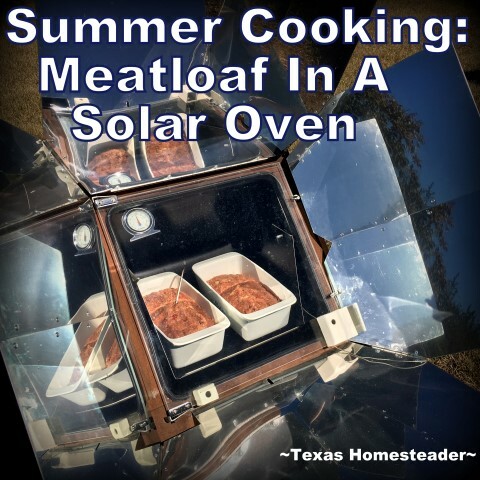 This entry was posted in Blog Posts and tagged Cooking, Recipes, Solar Cooking, Summer on August 5, 2018 by Texas Homesteader.